My name is Tor and I built my first kayak at one of Anders' courses in 2002. 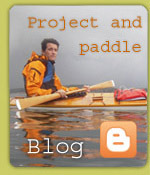 I had no idea what I was getting into â€“ I had barely been in a kayak before and had never built anything so advanced. It didn't take long before I was sold. I've built three more kayaks since then, of different types and sizes. Building kayaks is highly enjoyable, but it's at least as fun to paddle along the coast of Norway â€“ whether with friends or family. 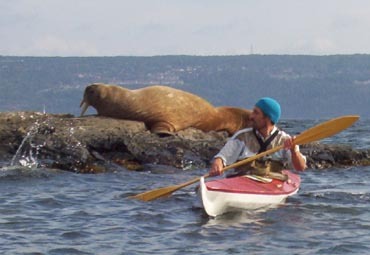 One of the special things about a kayak is that it's very quiet, so it's easy to approach birds and animals. I've attached a picture from a trip in Oslofjorden where I came into close contact with a walrus that had gotten lost and made its way into LangÃ¥ra. 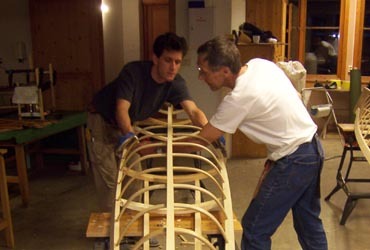 The pictured kayak is a baidarka â€“ the first one I built. It's turned out to be robust, and with minimal maintenance it's been a good long-distance craft through four seasons. It's easy to load with tent, sleeping bag, cookware, food and clothes. I can easily go for a week's trip with a few refills on the way. We have paddled Oslo- RisÃ¸r, RisÃ¸r-Mandal and Lysebotn-Stavanger-Haugesund with this kayak. It has performed well, also in storms and 2-3 metre high waves. Highly recommended. I'm paddling the red baidarka while my sister and father paddle the blue double baidarka. One of the good things about a kayak trip is the quiet evenings in the tent where we can sit on a deserted skerry, looking out over the archipelago and listening to seagulls and oystercatchers playing in the evening sun. My name is Susanne and I was given the opportunity to attend one of Anders' courses and build my own kayak when I was 13. I was a bit unsure about participating, since I'm not exactly the best at arts and crafts. But both my father and my grandfather had built their own kayaks, and I had heard a lot of good things about Anders' course â€“ so I took the chance. It was great fun! Long days and hard work, but the atmosphere was good and it was easy to get help when I had questions. I was proud and happy when at the end of the week I could go home with my own kayak. It didn't take many days before I got it on the water. The picture I've attached is from the maiden voyage. It's fun having a kayak that is tailor-made for me. 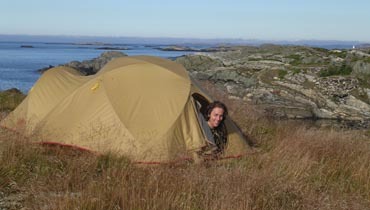 I chose to make an East Greenland kayak, which is easy to manoeuvre or roll in. It's also stable in rough weather, since it's so low and doesn't catch much wind. I'm glad I took the risk of building it myself. Anders: I've attached a picture from the construction course where I built a baidarka. It was great fun taking part in such a course. It's opened up a new world for me now that I'm retired. Being able to go on trips with friends and family, exploring archipelagos, lakes and rivers is fantastic. After I got the kayak on the water, I've practiced a lot of safety and a little acrobatics. I managed to learn the eskimo roll just before I turned 70! I've passed that milestone now, but paddling is still a good way to exercize. One of the things that surprised me after getting started is that I can kayak all year â€“ without getting cold. In December 2005 I went on an overnight trip with two others â€“ we had snow part of the time. Other times, we experienced shining sun and temperatures of -10Â°C (14Â° F). But in the kayak it's nice and warm no matter the conditions. It's a unique feeling to be out on the fjord when it's otherwise empty of boats. 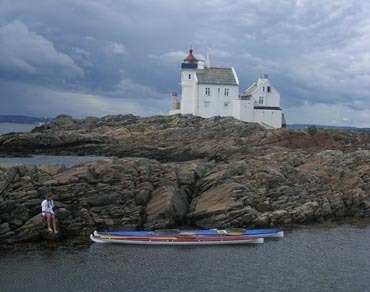 This summer I'm going back to my childhood haunts to paddle the Helgeland coastline from BrÃ¸nnÃ¸ysund to Ã˜rnes with my son and daughter-in-law. The trip will take about ten days â€“ with visits to skerries and islands on the way. I'm looking forward to it!